DearMYRTLE's Genealogy Blog: The Book of Me - Prompt 1 Who Are You? "The Book of Me, Written by You is a real opportunity to explore your memories, thoughts, information from your life, things that you can remember, and perhaps the passing on of oral history. Over the course of the next 15 months you can explore your life via a series of weekly prompts which will be delivered via Thomas at GeneaBloggers. This group exists to enable discussion and hopefully feedback to accompany the prompts. I have added to the files the background information to the physical workshops that I wrote and subsequently delivered, along with further details with a genealogical slant. This is a chance to explore yourself and create a legacy for future generations to read. Some of the prompts are deep, some are basic and a mix of everything in between. The prompts are delivered in a random fashion. This is truly a road of self discovery and exploration." So I've decided to follow the prompts. Naturally the first entry is a little late. Look for Prompt 2's post tomorrow. Prompt 1: Who Are You? The prompt for week 1 is a recognized psychology test: Ask yourself 20 times “Who are you?” Each time you should give yourself a different answer, and if you can easily go beyond 20 entries then that is fine too. This prompt is about how YOU see YOU. 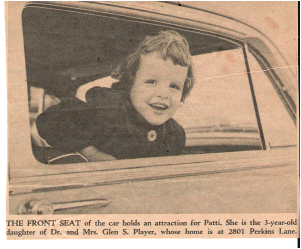 following the publication in a local newspaper circa 1954. I am a little girl at heart. I am a family historian. I am an awesome grandmother. I am a life-long learner. I am only white hair on the outside. I still remember my dark brown hair of yesteryear. I am a techie nerd. I am a jam maker. I am ready to travel just about anywhere. I am fun to be with. I am an archives researcher. I am a spiritual person. I am thrilled watching life through the eyes of my grandchildren. It is almost May, 2014 and I am just finding Lesson 1 of Book of Me. I don't see Prompt 2 so I wonder if it is still possible to follow this idea. It really appeals to me.